The natural simplistic lines, durability and warm rustic charm of Amish log furniture make it a popular decorating choice for both the inside and outside areas of your home. For many Amish men, woodworking is their way of life. Sons learn the skills of the craft as they work alongside their fathers, until they too are master craftsmen. Many work in family workshops using simple tools to create their beautiful pieces of furniture. Others do use some modern tools such as table saws and wood joining tools. However, they do so without the use of electricity. Instead, they power their tools with belt driven systems or hydraulic pumps powered by diesel engines. The Amish believe in the simple ways of life and do not have electricity in their shops or their homes. Yet these master furniture makers produce gorgeous Amish home furniture in many different styles and designs in addition to log furniture. Although there are Amish settlements in twenty-four states, most log furniture comes from Montana, Pennsylvania, Ohio and Indiana. Amish furniture makers in each area of the country create pieces using the kinds of wood and techniques unique to their areas. For example, much of the log furniture crafted in Montana comes from a small Amish settlement in the foothills of the northwestern corner of the state. Harvested from the Kootenai National Forest, the wood chosen for making log furniture comes from lodge pole pines that are standing dead, which means the trees have already died and are still standing. Chosen because they have not absorbed any moisture from lying on the ground, standing dead trees are less likely to have any rotten areas or discoloration. Two other types of wood used in this area of the country, for special order pieces, are hickory and cedar. 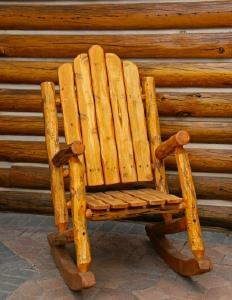 Amish woodworkers in Pennsylvania generally use sassafras wood for their log furniture. Regardless of which area of the country the log furniture comes from, Amish woodworkers allow all of the logs they use to dry completely naturally. Once the logs are dry, there are three different methods, or processes, of preparing the logs. Each process results in log furniture with a unique finished style. Skip Peeling: The process of skip peeling results in a style that is also known as rough rustic. To create this finish, the artisan uses a drawknife to peel off all of the outer bark and some of the inner bark layers, allowing the knife marks to remain. Removing Outer & Inner Bark: Another way of removing the bark results in a furniture style sometimes referred to as rustic elegance. In this method, the artisan uses a drawknife to remove all of the outer and inner bark. Sometimes the artisan sands the log to make the finish even smoother. Removing Inner Bark Only: The third process creates log furniture with a dark, rich appearance. In this process, the artisan uses the drawknife to remove all of the outer rough bark and leaves all of the smooth inner bark on the log. The inner bark is naturally darker in color. By applying a dark stain to the pieces before varnishing, they become even darker in color. Montana Woodworks in West Kooteni, Montana, offers a full line of log furniture including furniture for children and pet beds. Dutch Crafters offers Amish furniture from Holmes County, Ohio, and Lancaster County, Pennsylvania. If you use unfinished Amish log furniture outside, make sure to coat it with several coats of exterior lacquer to keep it looking beautiful through the years.